Here's a bit of a spin on the scanning project: an old map, with a new key. This map for The Spire of Woes was created in the early 90's as a quick location for a session in my Stormbringer (fourth edition, with that awesome Whelan cover) campaign. The campaign ran for something like fourteen or fifteen sessions, most of them head-to-head games with my friend Terry. My gaming style at the time was very loose and flexible. Instead of set-piece adventures, I liked to throw together locations and NPC's on the fly. The flow of the campaign was almost entirely driven by the actions of Terry's character, Drovis, who through his own Conan-like determination and lust for power quickly rose from impoverished sailor to Sea King. To this day, the characters and events of that campaign are some of the most memorable. Admittedly, I wasn't so much playing in Moorcock's world as I was in one of my own devising that just happened to share the names of a few places and peoples. I was somewhat inspired by the television cartoon The Pirates of Darkwater, which originally aired around the same time as our campaign. But I was also heavily inspired by the artwork of a number of fantasy artists (Boris, Frazetta, Whelan, Kelly, etc.). I had trading cards depicting these artists' works, and used them to inspire me to create characters and locations with which to populate my world. 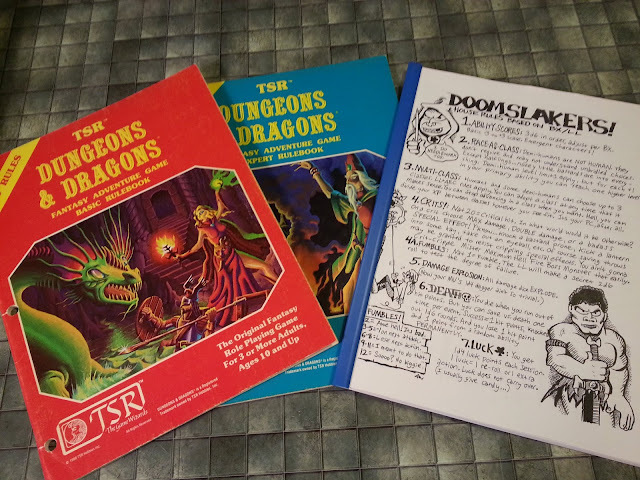 The end result was a binder full of people and places I could draw from as the need arose, something that was indispensible to - perhaps even responsible for - my on-the-fly style of running these games. 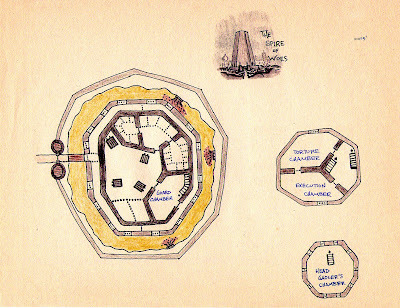 The Spire of Woes is one such location: a Pan Tangian prison, drawn up after Drovis and crew's unintentional landfall on the isle of Pan Tang and subsequent capture and arrest there. 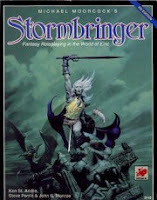 At the time, there was no real key to this "dungeon," since I ran it as most of my other games of Stormbringer: I had the location, the characters and creatures likely to be found therein, a sense of what was going on within its walls, and the set-up for the game. Everything else was played off the cuff. So, here's my almost-20-year-old map of The Spire of Woes, along with a brand new key (using B/X Dungeons & Dragons stats). Enjoy! Sweet. I wish you would have kept the BRP stats for everything, but it's still cool. And of course plenty of players set the game in their own original worlds. You can still find a few on the Web, but you might need your Demon of Knowledge to help you find them. @Jerry Cornelius: Keep an eye out - I'll be posting the original Stormbringer NPCs' stats soon. Nice old-school map, very artistic.